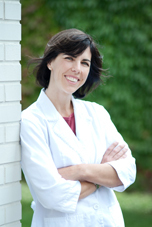 Dr. Julie Bereza was born and raised in Ottawa, Ontario. She graduated from the Ontario Veterinary College in 1997.During her studies, she was an active volunteer in wildlife centers rescuing, treating and rehabilitating injured and orphaned wild animals. After graduation, she practiced in Toronto and London Ontario. Dr. Bereza joined the team at Baker Animal Hospital in 2001. She is passionate about working with both senior and young pets and very much enjoys her interactions with their owners. She purchased Baker Animal Hospital in early 2011 and now is also the hospital administrator. When not working, she takes pleasure in eating well, especially if someone else is cooking ,or even better, by exploring Montreal’s innumerable excellent restaurants. Her interests include painting and sketching, dance, and traveling. Most of all, Julie enjoys spending time with her two daughters Rachelle and Sophie, and high school sweetheart, Alain, who is now her husband.